SAM Pro Free is the easy to use plugin that provides a flexible logic of displaying advertisements. Scheduling and limitations by impressions/clicks. Restrictions by the site page types. Restrictions by posts/pages ids, categories, tags, custom taxonomies terms, custom post types. The automatic embedding of ads into the content of posts/pages. Outputting using widgets, shortcodes and functions is available. Safe data migration from the Simple Ads Manager plugin. © 2015 – 2016, minimus. All rights reserved. What is the difference between SAMpro and Simple Ads Manager? Is there any reason I would not want to switch over? 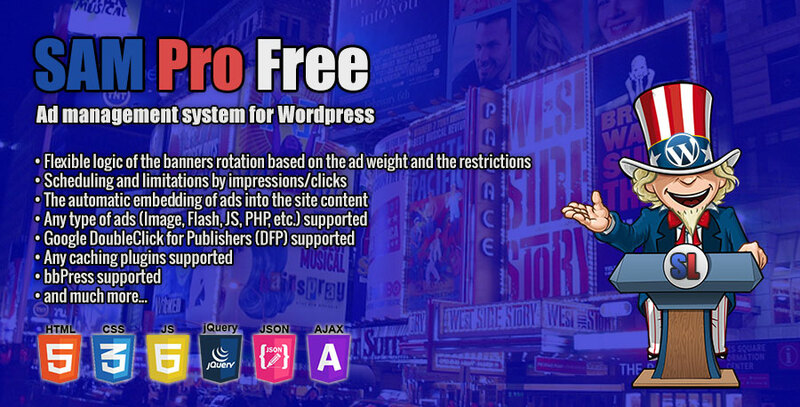 SAM Pro Free is the successor of WordPress plugin Simple Ads Manager. This is not extended version of Simple Ads Manager (aka SAM Free or SAM2) plugin. The concept of this plugin is very similar to SAM Free but is more complete and flexible. I use Sam Pro Free and it’s awesome. Thanks for the good work! I will be probably upgrading de plugin sometime soon. I’ve found what’s seems to be a small error. When you’re editing an ad, under General Restrictions –> Show ad only on pages of this type: (selected) –> Selecting only Home page. It shows the ad on all pages and posts, and not only in the home page as it should. In this case it’s a widget ad. But I’ve found the same problem selecting only posts and appearing also on pages. Free version was working fine, now suddenly all ads are only visible when logged IN! No one was working in the site, nothing changed. Assistance requested.